When my grandparents said they were moving to the Vendée several years ago the first thing we all did was say ‘where?’ and quickly look it up on Google. The first visit was a shock to the system as they live in a very rural area; there were stars at night, no sound of trucks and cars rumbling by, and some very strange animal noises that came from the nearby wood. But several visits later and we are all in love with the area and try to get down a much as possible. We were first introduced to the local wines through the wines of Pissotte -some easy drinking reds and rosé wines that were pleasant on a warm summers evening. In the local supermarkets there is a choice of Loire, Bordeaux, Burgundy, various Cremants and a very small selection of New World wines; but little in the way of local wines, hopefully with the creation of a the new AOC this will change. 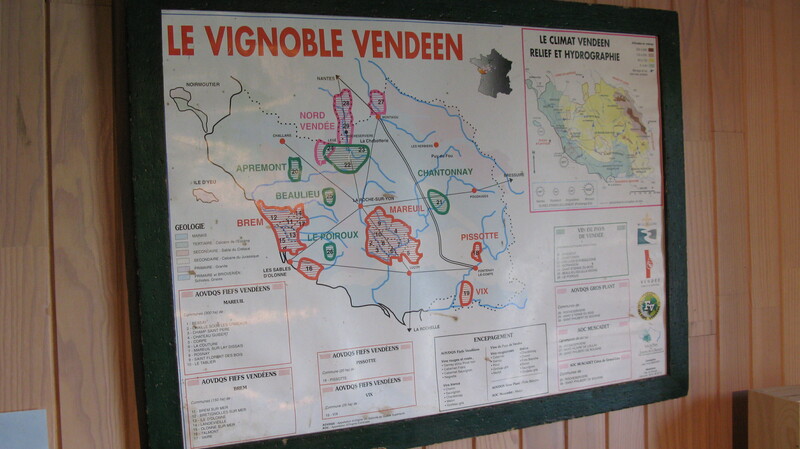 The Vendée is in western France, just at the bottom of the western Loire Valley. 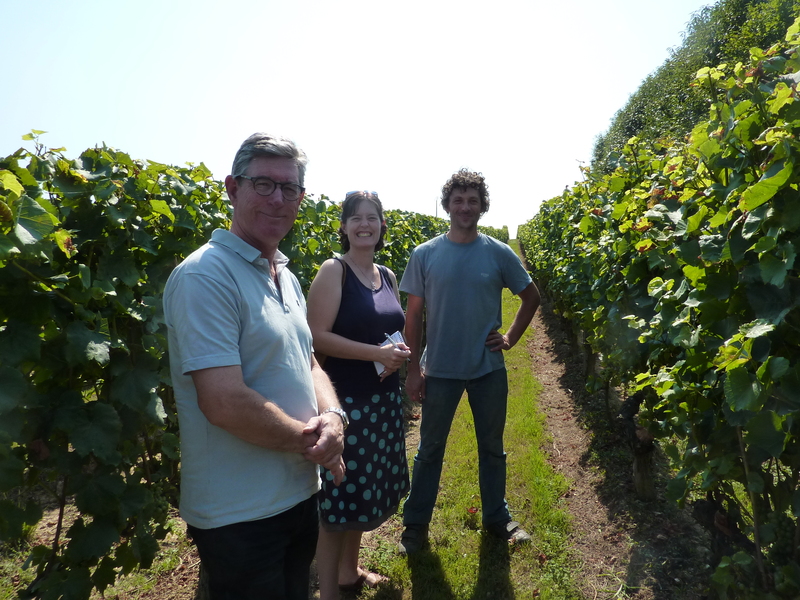 Within the Vendée area Pissotte and Mareuil are popular and well known areas of production and in 2011 they joined together with three other local areas; Brem, Vix and Chantonnay, to create AOC Fiefs Vendéens. The AOC covers white (which must have 50% Chenin Blanc), rosé and red (Gamay and Pinot Noir together must constitute 50% of any blend) wines. And luckily there was an AOC Fiefs Vendéens – Chantonnay vineyard very close to where we were staying – Domaine de la Barbinière. The vineyard was started by Philippe Orion in 1978 and is now run by his sons Vincent and Alban. Vincent who has spent sometime in New Zealand has developed a great appreciation for the use of oak and likes to experiment with the wines, while Alban runs the vineyard. Over 75 acres they grow eight grape varieties; Chardonnay, Chenin Blanc, Sauvignon Blanc, Pinot Noir, Gamay, Cabernet Sauvignon, Carbernet Franc and Negrette. They try to spray as little as possible, plant grass between the vines and do as much by hand as possible, including hand picking, which must be hard work as their 75 acres are spread around Chantonnay, with the furthest being 15km away from the winery. Vincent said that they are still two weeks away from harvest and were lucky that they did not suffer from the hail that has devastated some of the wine regions of France this year. It can really cook in the Vendée but luckily as it is not far from the Atlantic coast there is a maritime influence in the vineyard which helps keep the temperatures down, which is especially good for the Pinot Noir which is planted on some late harvesting plots. I asked how much cooperation is happening between the new AOC producers and Vincent shrugged and said not as much as he would like. He also said that they have to rely mainly on tourists for sales as there is little interest in the local area which is a shame as they are missing out on a great local product. With a bit of cooperation between the producers, the local tourist board and local retailers these wines could really start to take off. The production levels aren’t huge so how much noise they could make on the international stage, or even within France, is debateable but they need to start shouting out loud about them in the Vendée. They also produce medium-sweet, sweet and sparkling wines which can be found at http://www.domainedelabarbiniere.com. My Nan came with us on the visit and it was nice to visit with someone who had not been on a vineyard tour before as she asked questions that perhaps I would forget to, or feel that I should already know the answers to; and I think it has given my Nan plenty to talk about and an appreciation of how much work goes into making her nightly tipple.